And don’t get me started on the word cinnamon.! I know it sounds silly but for the longest time I couldn’t say it correctly! LOL!!! Here in Texas if you go anywhere for breakfast or brunch you are bound to find Huevos Rancheros on the menu. It is basically an open faced breakfast taco. Yummers! And even though I have lived in Texas almost my whole life, surrounded by Mexican/Tex-Mex food, I still have trouble saying Spanish words (of course I have trouble speaking Spanish, I have trouble speaking my native English)! And even though I grew up eating Mexican food, I had never had Hevos Rancheros. Eric always talks about them and how good they are and when I saw them in this month’s CBOM I knew I had to make them. The only problem? I couldn’t pronounce them correctly. Of course Eric teased me about this. He then sounded it out for me and I still had trouble saying it. So he then waves his and says to pronounce it ‘waveos’. I finally got it! So one morning we went over to Eric’s parents house and I made these for brunch. Everyone loved them!!! And raved about them (all day long). But because I was cooking in someone else’s kitchen (which can sometimes be a hard task) I had to change up the original recipe quite a bit to use what I had on hand. That is where the name Heather’s Huevos came from. Eric decided that since I pretty much completely disregarded the original recipe and had such a hard time saying ‘Huevos’ that I should name this recipe after myself. So I did! In a large skillet over medium-high heat, cook and crumble the sausage until browned. Drain and add cooked meat back into the pan. Stir in the onion and serrano pepper. Cook for 3 to 4 minutes. Add the garlic and cook 1 to 2 minutes more. Set sausage mixture aside and keep warm. Add butter to skillet and melt. Working in batches, crack the eggs into the pan. Cook until the bottoms are set and the edges golden, 1 to 2 minutes. Turn the heat to medium-low, cover, and cook until set, about 1 minute more. Heat the refried beans. Spread the beans on the tostados. 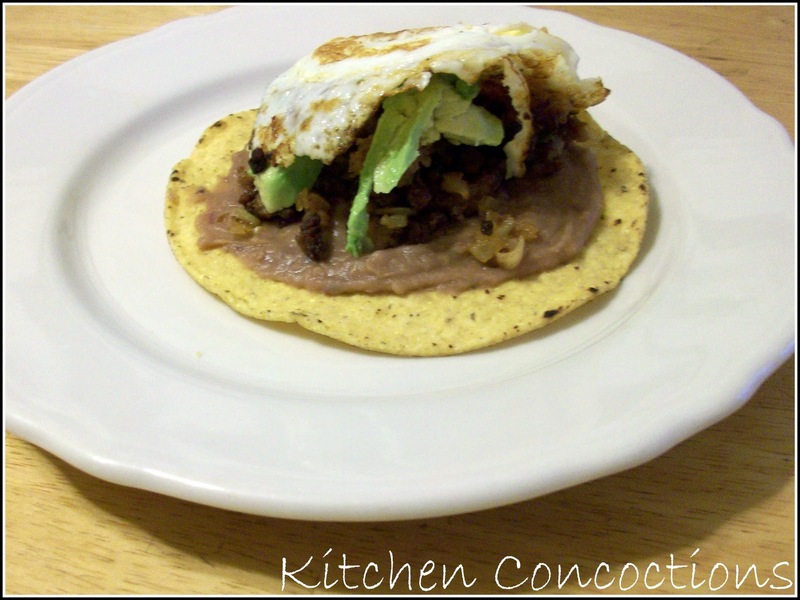 Top beans with cheese, prepared sausage mixture, avocado slices and then egg. Serve warm.